Please Note: As of Summer, 2006, I have stopped updating this Oracle collecting list. Barbara Gordon continues to be a driving force in Birds of Prey and all issues of that title are recommeded as Essential Reading for all Babs fans. Batman 615, July 2003, “Hush, Chapter Eight: The Dead” — showing �If you aren't reading Loeb & Lee's amazing run on this title, you're missing some of the finest Batman storytelling ever. 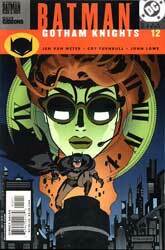 Batman 633, December 2004, “War Games: Act 3, Part 8: No Going Back” — featured �kiss the clocktower good-bye! Batman: Gotham Knights 32, October 2002, “24/7” — showing � Devin Grayson's finale on this title is just a beautiful story of a day in the life of Bruce Wayne and Batman. Batman: Secret Files and Origins 1, October 1997, “(one-page "Birds of Prey" bio sheet)” — showing � BoP! Birds of Prey 1, January 1999, “Long Time Gone” — co-starring � BoP! Birds of Prey 10, October 1999, “The Wrong Guy” — co-starring � BoP! Birds of Prey 11, November 1999, “State of War” — co-starring � BoP! Birds of Prey 12, December 1999, “Hellbound Train” — co-starring � BoP! Birds of Prey 2, February 1999, “One of Those Days ” — co-starring � BoP! Birds of Prey 3, March 1999, “Hounded” — co-starring � BoP! Birds of Prey 4, April 1999, “The Ravens Strike” — co-starring � BoP! Birds of Prey 5, May 1999, “Monster” — co-starring � BoP! Birds of Prey 6, June 1999, “Time's Rainbow” — co-starring � BoP! Birds of Prey 7, July 1999, “The Villain” — showing � BoP! Birds of Prey 8, August 1999, “On Wings” — starring � BoP! Birds of Prey 9, September 1999, “Girls Rules” — co-starring � BoP! Birds of Prey 13, January 2000, “Apokolips Express” — showing � BoP! Birds of Prey 14, February 2000, “Apokolips Express -- Part Two” — showing � BoP! Birds of Prey 15, March 2000, “Face Time” — co-starring � BoP! Birds of Prey 16, April 2000, “The Joker's Tale ” — co-starring � BoP! Birds of Prey 17, May 2000, “Nuclear Roulette” — co-starring � BoP! Birds of Prey 18, June 2000, “The Hateful” — co-starring � BoP! Birds of Prey 19, July 2000, “Masks” — starring � BoP! Birds of Prey 20, August 2000, “The Hunt for Oracle -- Part Two: The Noose!” — featured � BoP! Birds of Prey 21, September 2000, “The Hunt for Oracle -- Part Four: The Deep” — co-starring � BoP! Birds of Prey 22, October 2000, “The Hostage Heart -- Part One” — co-starring � BoP! Birds of Prey 23, November 2000, “The Hostage Heart -- Part Two” — co-starring � BoP! Birds of Prey 24, December 2000, “The Hostage Heart -- Part Three” — featured � BoP! Birds of Prey 25, January 2001, “Old Habits” — co-starring � BoP! � with the Blue Beetle! Birds of Prey 26, February 2001, “The Suitor” — featured � BoP! Birds of Prey 27, March 2001, “Officer Down -- Part Three: Armed and Dangerous” — starring � BoP! Birds of Prey 28, April 2001, “History Lesson -- Part One: Time to Kill” — co-starring � BoP! Birds of Prey 29, May 2001, “History Lesson -- Part Two: Valhalla, Baby!” — featured � BoP! Birds of Prey 30, June 2001, “History Lesson -- Part Three: Time and Time and Time Again!” — featured � BoP! Birds of Prey 31, July 2001, “The Big Romance” — featured � BoP! Birds of Prey 32, August 2001, “The Stray” — co-starring � BoP! Birds of Prey 33, September 2001, “The Courtship” — showing � BoP! Birds of Prey 35, November 2001, “The Shout” — co-starring � BoP! Birds of Prey 36, December 2001, “Canary Caged” — showing � BoP! Birds of Prey 38, February 2002, “The Next Little Thing” — co-starring � BoP! Birds of Prey 39, March 2002, “Bruce Wayne: Murderer? Part Five: The Gun” — co-starring � BoP! Birds of Prey 40, April 2002, “Bruce Wayne: Murderer -- Part 12: Switchback” — co-starring � BoP! Birds of Prey 41, May 2002, “Bruce Wayne: Fugitive -- Part Two: Felony Matters” — co-starring � BoP! Birds of Prey 42, June 2002, “Karen's Story” — featured � BoP! Birds of Prey 43, July 2002, “Bruce Wayne: Fugitive � Part Ten: Blind Spot” — co-starring � BoP! Birds of Prey 46, October 2002, “Cretaceous Picnic” — showing � BoP! � Dixon's finale on this title gives short shrift to the Birds themselves. Birds of Prey 47, November 2002, “The Chaotic Code, Part One: Icarus Rising” — co-starring � BoP! �Terry Moore's first issue debuts a new costume for Dinah and a new wheelchair for Oracle. Birds of Prey 48, December 2002, “The Chaotic Code, Part Two: Crash & Burn” — co-starring � BoP! Birds of Prey 49, January 2003, “The Chaotic Code, Part Three: Family Matters” — co-starring � BoP! Birds of Prey 50, February 2003, “Busman's Holiday” — co-starring � BoP! � Gilbert Hernandez starts his six-issue tenure with a bang! Birds of Prey 51, March 2003, “Let's Get Elemental” — co-starring � BoP! Birds of Prey 56, August 2003, “Of Like Minds” — co-starring �the new team of Gail Simone, Ed Benes, and Alex Lei kick things off with a bang! Birds of Prey 61, January 2004, “Feeding the Game, Part Two” — co-starring �every issue of Simone's run to date has been a MUST! This one is the most pivotal BoP issue yet. Birds of Prey 71, Early October 2004, “Between Dark and Dawn, Part Three: Insanity Defense” — co-starring �plus Superman! Birds of Prey 90, March 2006, “Perfect Pitch, Part Five” — co-starring �Batman guest-stars... and gets quite a surprise from Dinah! Birds of Prey: Catwoman/Oracle 2, 2003, “” — starring � Oracle shows her stuff against two Catwomen! Birds of Prey: The Ravens , June 1998, “S.I.M.O.N. Says Armageddon” — showing � BoP! Black Canary/Batgirl: Birds of Prey , February 1998, “Birds of Prey” — co-starring � BoP! Black Canary/Oracle: Birds of Prey 1, 1996, “One Man's Hell” — co-starring � BoP! Black Canary/Oracle: Birds of Prey , 1997, “Revolution” — co-starring � BoP! Black Canary/Oracle: Birds of Prey , October 1997, “Wolves” — co-starring � BoP! Black Canary/Oracle: Birds of Prey: Manhunt 1, September 1996, “Where Revenge Delights” — co-starring � BoP! Black Canary/Oracle: Birds of Prey: Manhunt 2, October 1996, “Girl Crazy” — co-starring � BoP! Black Canary/Oracle: Birds of Prey: Manhunt 3, November 1996, “The Man That Got Away” — co-starring � BoP! Black Canary/Oracle: Birds of Prey: Manhunt 4, December 1996, “Ladies' Choice” — co-starring � BoP! Detective Comics 723, July 1998, “Brotherhood of the Fist � Part Two: Fight Back to Gotham” — showing � BoP! Detective Comics 784, September 2003, “Made of Wood, Part One” — featured �shown in a photograph but mostly heard from offscreen. Formerly Known as the Justice League 5, January 2004, “The Wrath of Manga Khan” — featured �Blue Beetle calls in the ultimate backup to help the Former JLA! Green Arrow 115, December 1996, “The Iron Fist” — featured � BoP! Green Arrow 116, January 1997, “The Iron Fist” — featured � BoP! Green Arrow 117, February 1997, “The Iron Fist” — featured � BoP! JLA 17, April 1998, “Prometheus Unbound” — showing � Oracle joins the JLA in this issue. JLA 37, January 2000, “World War III � Part Two” — featured � and on the cover! JLA/Titans 2, January 1999, “The Generation Gap” — showing � BoP! JLA: Welcome to the Working Week , 2003, “” — showing �"You're lucky our sea-king isn't here!" Joker: The Last Laugh 1, December 2001, “Stir Crazy” — featured � BoP! Joker: The Last Laugh 2, December 2001, “Siege Mentality” — featured � BoP! Joker: The Last Laugh 3, December 2001, “Lunatic Fringe” — featured � BoP! Joker: The Last Laugh 6, January 2002, “You Only Laugh Twice” — featured � BoP! Legends of the DC Universe 3-D Gallery 1, December 1998, “” — featured � her "mask" face is pictured in a terrific shot of the Birds in action � BoP! Nightwing 23, August 1998, “Brotherhood of the First � Part Four: Paper Revelations” — featured � BoP! Nightwing 39, January 2000, “By Force of Arms” — co-starring � and on the cover! Nightwing 56, June 2001, “Stalked” — featured � BoP! Nightwing 57, July 2001, “Yesterday Never Dies” — featured � BoP! Nightwing 71, September 2002, “Something About Mary” — featured � Devin's first issue on Nightwing moves like a runaway freight train! Robin 55, July 1998, “Brotherhood of the Fist � Part Three: Monkey Fist” — showing � BoP! Robin 95, December 2001, “Book of the Dead” — featured � BoP! Suicide Squad 27, May 1989, “?” — showing � Waller and Flo mention Oracle but she is not seen or heard in this issue. Suicide Squad 32, August 1989, “?” — showing � Oracle is seen in her wheelchair, but only from the neck down, while she is chatting online with Flo. Suicide Squad 33, September 1989, “?” — showing � Oracle is mentioned as the source for information on the squad's current case. Suicide Squad 34, October 1989, “?” — showing � Waller orders Flo to ask Oracle for help on the squad's current mission. She is not seen or heard directly. Titans 1, March 1999, “That Strange Buzzing Sound” — showing � really a mention. When the question is posed as to "who's leading the JLA these days?" the Titans offer up a variety of answers but Arsenal's daughter Lian has the last word when she says "Owacle." Wizard Magazine 148, February 2004, “Book of the Month: Birds of Prey” — co-starring �Even Wizard is able to see how much the new BoP team rocks! Wonder Woman 174, December 2001, “The Witch and the Warrior: Part One” — showing � BoP!